Hi everybody! We are past due with a Team Solly update, so here is a quick summary of what is going on with Jim and his cancer journey. 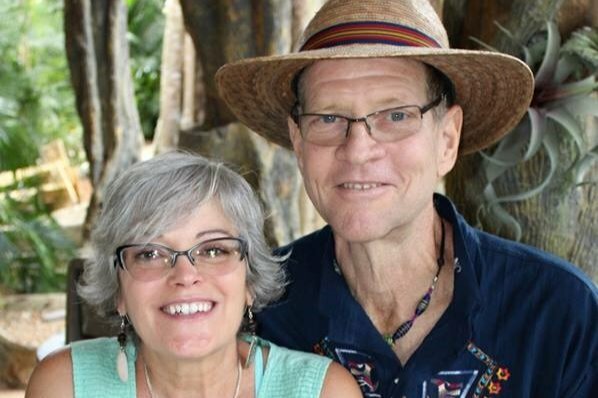 Through an extremely fortunate series of events, Jim was invited as one of only a handful of Americans to participate in a non-invasive, experimental treatment program in South America. He has been receiving this treatment since September, and so far, it has been a success! He immediately began feeling stronger, regaining his appetite and his energy. Today, you wouldn’t guess he was sick if you saw him for the first time, which is a big change over where we were 3 months ago. He has gained weight and muscle mass, and has a healthy “glow” in his face. We had a pretty big, scary setback a few weeks ago, when he had to go to the emergency room with a dangerously swollen leg. His leg had been swelling for quite some time because of a tumor blockage, but it became critical in both size and in the level of pain he was experiencing. He was diagnosed with an enormous blood clot, which took a week in the hospital and 4 surgeries to clear. The good news is they were able to clear it, and are hopeful that the potential for future clots will be easily managed with a daily blood thinner medication. More good news is that the uncomfortable leg swelling he has been living with since July is going down! While his leg will probably never be the same size as the other one, the swelling and pain are much more tolerable with just a few lifestyle changes. He had a PET scan a few weeks ago here in Miami to assess the spread of his disease. 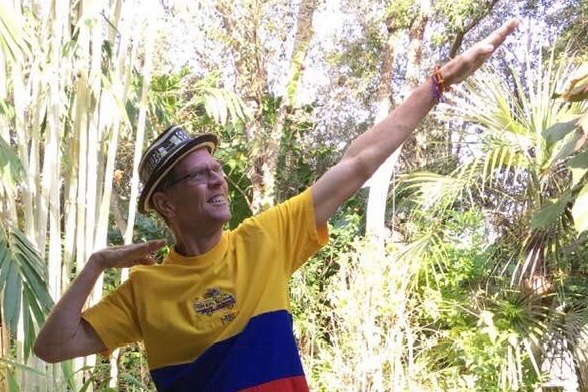 The in-house tests they have run on him at the clinic in Colombia indicate that we should be seeing improvements on the scan, and that appears to be the case! The tumor “shadows” are all still present, but the images show that the volume of the masses is decreasing! He is progressing exactly how the doctors at the clinic expected and hoped he would. The treatment is intense, and requires him to live 50% of his time in Colombia; leaving him only two weeks per month at home to handle his business and home responsibilities. We are ever so thankful for the success of this GoFundMe, because it has made it possible for us to pursue this treatment for Jim up until now. Luckily, the treatment itself does not cost us anything. But the travel and expenses of living in a foreign country add up quickly. I have stopped going with him in an effort to reduce costs, but it’s hard for us to be apart during such a challenging time. Overall, Jim is doing very well. He suffers from chronic pain, similar to sciatica back pain, due to the position of one of the tumors. I know this is very uncomfortable for him, but he never complains about it. He is optimistic and in good spirits, hopeful that this treatment is going to give him back his life. It is hard to be away from home for so long, and we really don’t know how long he will have to keep up this pace. Thankfully, our business customers are being patient with his inability to keep on schedule, but it causes him a lot of stress worrying about the neglected business and lack of income. Thank you to our Team Solly friends for staying with us throughout this long journey. It is only because of your support - both emotionally and with your generous donations - that we have a reason to be hopeful today! Cancer is a damnable foe, and it brings all its weapons to the fight. When things started looking bleaker than we were prepared for earlier this summer, our circle of wagons got even tighter. Not only did we receive heartwarming love and encouragement, but our friends really sprang into action. Cathy Day and Laurie Wade created a robust GoFundMe campaign for us; Bart Motes and his family hosted a very successful orchid auction on our behalf; many of our business partners and customers came to our emotional and financial aid; and just this past weekend, an amazing blow-out orchid auction was hosted by our friends Paul Price, and Dave and Cherie Blickenstaff. The volunteers, orchid vendors, and friends who so generously donated on our behalf and attended the event are too many to name here, but we are so grateful to each and every one. I do have to shout out to the amazing Mac & Helen Rivenbark, though, for standing in the hot sun for 7 hours, auctioning the hundreds of donated items! It is clear to us that it is no longer “Jimmy and Wesi against the world.” The amazing members of Team Solly have made that apparent! Where once we felt like we couldn’t trouble our friends to help us through this mess, we now feel surrounded by people who genuinely care about our well-being. We have friends writing to tell us that the members of their church or temple are praying for us every week; people lighting candles around the world, gifting us with blessed relics to help speed Jim’s recovery. Artist friends who infuse their paintings and pottery with blessings and spells, and send a constant flow of that magic artwork to our home. Friends who travel from out of town, just to spend some time with us and share in our experience. Auction attendees who paid high prices to win items they thought would be special to me, and then turned around and gave them to me. Friends helping us through the maze of healthcare, and making possible treatments that wouldn’t normally be available to us. “Thank you” can’t even begin to express the deep appreciation and gratitude we feel. There are so many more gestures and kind messages I could mention, that have meant the world to us. Each is so very important to us! But let us not forget the financial support Team Solly has bestowed upon us. From the $5 gifts to the larger donations, each has made us emotional with thanks and humility. Because of your support, we are in a position to continue seeking alternative treatments out of the country without worrying that we’ll lose our home or our business will fail. Because of all of you, we have hope for a bright, happy, healthy future. For all of my life, I’ve been a reserved person who doesn’t easily throw around big scary words like, “love.” This journey has taught me a thing or two about love and compassion, though. It’s out there in abundance, and people *want* to share it with one another. People who come to us and say, “I know we've never met, but I’ve been following your story, and I want you to know that I love you.” That’s powerful. Let’s all open our hearts, and let in the love that’s out there, just waiting for us. I cherish the love that Jim and I have been given! Thank you, Team Solly, for everything you have done for us. We love you. I am so grateful for all of you that have shown us, and given us, your love and generosity! I feel to my core for the first time in five years that I have a chance to live cancer free. All of this would not be reachable for us if not for all of you and so many more selfless people. With all of the ugly in the world now, you all have painted right over it and made at least our world beautiful and full of possibilities for us. Before we received the call to come for treatment, I had decided to go to the funeral home to make arrangements so Alexis would not have to deal with it. Im now glad I didn’t. Hi everybody! Here's a quick update on what's going on with us. Our biggest news with this update is that we have decided to put the sale of our business on hold for now, even though we have a buyer. We simply do not have enough income to support ourselves after it is sold. Our reserves are gone, and the sale proceeds will have to go toward paying down our home mortgage. 5 years of paying for a serious illness have depleted us. Maybe take this opportunity to think about (and plan for) what you would do in a similar situation. Would you please share our gofundme link again? Many of you have been so generous already, and we are not asking you to reach back into your own pocket. I noticed today that we have over 6000 views. If each of those people had donated $10, we'd be in a position to be able to sell and give Jim the chance to relax and focus on healing. We say a heartfelt, "thank you!" to each of you who is supporting us with your love, encouragement, and donations. It all makes a big impact in our lives! !